We will take part at the TRAKO International Railway Fair again this year. And what about you? TRAKO is the largest and most prestigious rail industry meeting in Poland and one of the largest in Central and Eastern Europe. 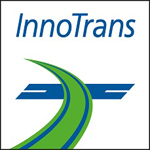 The tenth edition of InnoTrans was an industry event of superlatives. A new exhibitor and trade visitor record, 140 world premieres, 145 vehicles on the open-air site and increased visitor satisfaction are the central points of InnoTrans' best trade fair so far.